Excepting organ meats and anything that could be classified as a mollusk, I like to try new foods. The other day I had the opportunity to try two. It all started at a neat little market in my town that sells a lot of local produce, eggs, baked stuff, etc. As I was browsing I came across these odd looking orbs that turned out to be gooseberries. The sign said they were from a nearby farm that I am familiar with so I decided to buy a quart and see what I could do with them. At checkout the owner told me that the farm only has one gooseberry bush and every July they bring whatever gooseberries the bush produces to the market for sale. Last year, just two people bought the entire yield (I guess there are some big gooseberry fans in my town so I felt kind of lucky to get my mitts on some of this year’s crop. When I got home I was disappointed to learn that gooseberries are typically combined with sugar to make desserts or jams. I tried eating several raw and noted that they do not have much natural sweetness sort of half grape, half lemon. Then I discovered a traditional dish from the UK, grilled mackerel with gooseberry sauce. Ding! Ding! Ding! Id been meaning to try mackerel ever since I read a recent post over at Mark’s Daily Apple espousing the unique health benefits of this fish (mainly its omega 3 content. Here was my chance! I will admit that when the guy handed me that whole fish at the market I felt a little nervous. However, let me tell you from someone who has not always liked fish and will still not eat any old fish that there was absolutely nothing ‘weird’ about the taste of this mackerel. 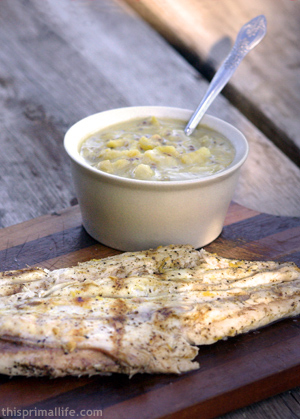 These fish live in super cold northern waters and the taste is very clean and mild. The only downside to mackerel, in my opinion, is that they are somewhat bony. The gooseberry sauce turned out wonderfully. It was fresh, tart, citrusy and not the slightest bit bitter. Unless you prepare more than one mackerel, you’ll probably have some sauce left over. Freeze it! You could use this sauce on so many things: fish, pork, chicken, Thanksgiving turkey. Don’t have any gooseberries on hand I was wondering what this might taste like if you substituted blueberries for the gooseberries. I’d add a little lemon juice to the sauce. Let me know if you try this! 1. Prepare the mackerel. Clean fish and remove head and tail. Cut lengthwise stopping short of cutting the fish entirely in half so you can open the fish up hot dog bun style. Rub skin and flesh sides with olive oil. Sprinkle flesh side with salt, pepper, and lemon zest. Set aside. 2. 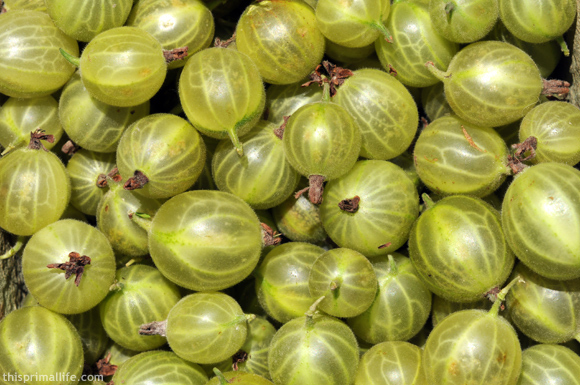 Make the gooseberry sauce. Place gooseberries in a saucepan with the wine. Simmer for 15-20 minutes, or until gooseberries are very soft. Remove from heat and smush the berries with the back of a spoon. Add orange juice concentrate, cream, and orange zest. Return to burner and heat over low heat until warm. 3. Grill the mackerel. Place fish skin side down on heated grill. Cook 5-10 minutes (this really depends on how hot your grill is just keep an eye on it. 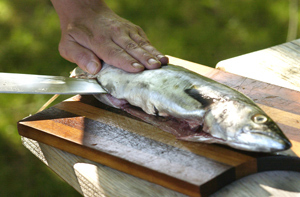 Then, if you are feeling adventurous you can try to flip the fish over to get some grill marks on the flesh side. This may result in a big mess so proceed with caution. 4. Transfer the fish to a serving platter, carefully remove whatever bones you can and serve with gooseberry sauce and lemon wedges. Aren't they pretty These are the gooseberries I used. Mine were green but they also come in purple. Hello! I just stumbled on your blog and I’ve already read through most of it! I like the recipes and anecdotes you share. I’m really excited about meeting new people who have adopted the Primal/Paleo nutritional concept. I’m adding you to my blogroll. Just started to cook mackerel once every week, thanks for this recipe. Now I just have to find gooseberries 😉 I never knew mackerel was so healthy and I’ve eaten so much salmon for my omega’s, now I have something else to cook and it’s pretty delicious. I’ve been trying to eat more fish and it’s been a while since I had mackerel. The gooseberries look great! I like the sound of using gooseberries in a savoury sauce! I used to be a salmon-only girl, but eventually got over that when my husband’s parents started sending us halibut from Alaska where they live. Now I’ll try all sorts of fish. Finding the gooseberries might be a challenge depending on where you live. Blueberries are in season now (at least where I live) and I think you could pull off an interesting sort of sauce with them, too. I love both. Going to have to try this one. Have a pile of Gooseberries in my freezer that I picked off a big bush my Mom has. I love Mackarel, its healthy and great for you. I have been looking for better ways to prepare this dish for a while. These days I make sure that the Mackarel that I buy is from sustainable fishing sources. Not mentioning Japanese food made with raw fish.